WALKER, ANNA LOUISA (Coghill), teacher and author; b. c. 1836 in Staffordshire, England, youngest daughter of Robert Walker, a civil engineer, and Anna —; m. 29 Jan. 1884 Harry Coghill (d. 1897) in London, England; they had no children; d. 7 July 1907 in Bath, England. Annie Louisa Walker came to Lower Canada as a child with her family. They lived first at Pointe-Lévy (Lévis) and then moved in 1858 to Sarnia, Upper Canada, where her father continued to work for the Grand Trunk Railway. That year Annie and her sisters, Isabella and Frances, opened a private girls’ school. A woman who attended it described the sisters thus: “They were very English, very dignified, and somewhat exclusive, but were excellent teachers, especially in the departments of history and English literature. Anna was the . . . best looking. . . . At times her face had a pensive and somewhat dreamy expression. Her manner was gentle and sweet.” On the deaths of Annie’s sisters a few years later, the school closed. In 1861 Annie, who had been publishing poems in periodicals and newspapers since her teens, brought out a collection by subscription, Leaves from the backwoods, through the Montreal house of John Lovell*. Shortly thereafter she returned to England with her parents, who soon died. She then contacted her second cousin, Mrs Margaret Oliphant, a widow and successful writer, and about 1865 became a member of her extended family. As Mrs Oliphant’s companion-housekeeper from 1866, she cared for the children during her cousin’s frequent prolonged absences, acted as secretary, and looked after proofs and other writing matters. In turn, Margaret Oliphant, although she did not seem to take Annie’s literary ambitions seriously, urged her to shift her interest from poetry to fiction and recommended her to publishers. Between 1873 and 1881 Walker brought out five novels and a volume of plays for children. Following her marriage to a wealthy widower and move to Staffordshire, Annie did not give up writing completely; she published one more novel, at least one story, and a second book of poetry. Of the works in that collection of poems, Oak and maple: English and Canadian verses (1890), two-thirds had appeared in Leaves. Her poems are largely about religion or nature. The most effective are those characterized by unpretentious phrasing and directness of expression, but most are conventional in diction, form, and subject matter. At times her nature poems are close to transcendental in their expression of the spiritual in nature. The lyrics of the well-known hymn “Work, for the night is coming” derive from her poem “The night cometh,” which first appeared in Leaves. In Oak and maple she remarks on discovering the verses in a hymn-book, but without accreditation. The meditative poem “In the Canadian backwoods” makes the frequent complaint of poets about the lack of a mythology in a new land and notes the absence of nymphs in the Canadian woods, suggesting that it is simply too cold for them there. Walker’s writing career began in Canada and her most telling poems are the Canadian nature poems written in her youth. 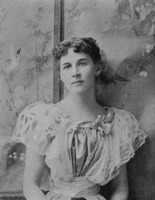 The best known of her verses, however, are the lyrics of “Work, for the night is coming.” In A Canadian heroine she was an early exponent of the international theme of the New World versus the Old, which American Henry James was to popularize later and Canadian Sara Jeannette Duncan* was to employ in the 1890s. Annie Louisa Walker’s Leaves front the backwoods (Montreal, 1861) appeared anonymously, as did a second edition issued there the following year and the first of her novels, A Canadian heroine, a novel; by the author of “Leaves from the backwoods” (3v., London, 1873). Four additional three-volume novels were published in London under her maiden name, Hollywood . . . (1875), Against her will . . . (1877), Lady’s Holm . . . (1878), and Two rival lovers . . . (1881), as well as a volume of Plays for children (London and New York, 1876 [i.e., 1875]). A later edition of the last item (London, 1896) appeared under the subject’s married name, Mrs Coghill, as did her second collection of poetry, Oak and maple: English and Canadian verses (London, 1890), another novel, The trial of Mary Broom; a Staffordshire story (London, 1894), and a short story, “The vicar of Moor Edge,” published in Leisure Hour (London), 1895: 683–93, 751–60. As Mrs Harry Coghill she edited her cousin Margaret Oliphant Wilson Oliphant’s Autobiography and letters of Mrs. M. O. W. Oliphant (Edinburgh and London, 1899). GRO-L, Death certificate, A. L. Coghill, 7 July 1907. NA, RG 31, C1, 1861, Sarnia. National Library of Scotland (Edinburgh), Dept. of Manuscripts, Ace. 5793 (Margaret Oliphant papers); Blackwood mss. Vineta Colby and R. A. Colby, The equivocal virtue; Mrs. Oliphant and the Victorian literary marketplace ([Hamden, Conn.], 1966). A history of Sarnia to 1900, comp. G. L. Smith and L. K. Smith (Bright’s Grove, Ont., [1973?]). A. W. Mahon, Canadian hymns and hymn-writers (St Andrews-by-the-Sea [St Andrews, N.B. ], 1908). Merryn Williams, Margaret Oliphant.a critical biography (Basingstoke, Eng., 1986). Lorraine McMullen, “WALKER, ANNA LOUISA,” in Dictionary of Canadian Biography, vol. 13, University of Toronto/Université Laval, 2003–, accessed April 24, 2019, http://www.biographi.ca/en/bio/walker_anna_louisa_13E.html.